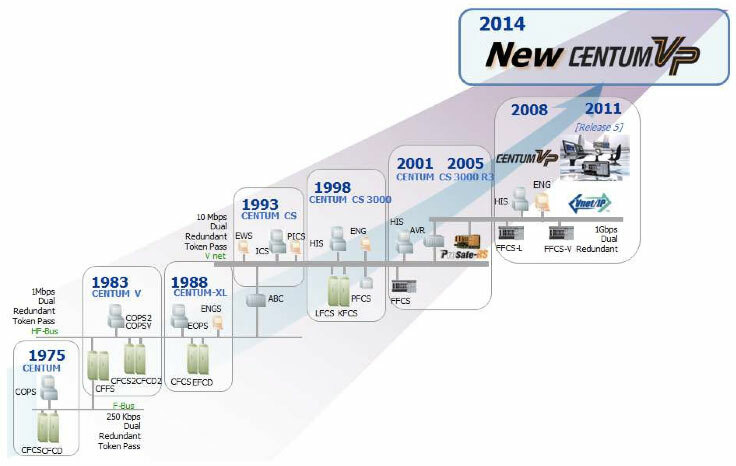 In 2014 Yokogawa is releasing New CENTUM VP, bringing significant new capabilities to the DCS product line it has supported and evolved for almost 40 years. Yokogawa Electric Company (TYO:6841) is a $3.3 billion process automation supplier serving these industries with automation and measurement solutions. Yokogawa brings a Japanese-style corporate culture of quality to its automation business, along with a commitment to high performance products, lifelong compatibility, and comprehensive customer support. Yokogawa has evolved its CENTUM distributed control system (DCS) for almost 40 years since its introduction as one of the world's first DCS products. 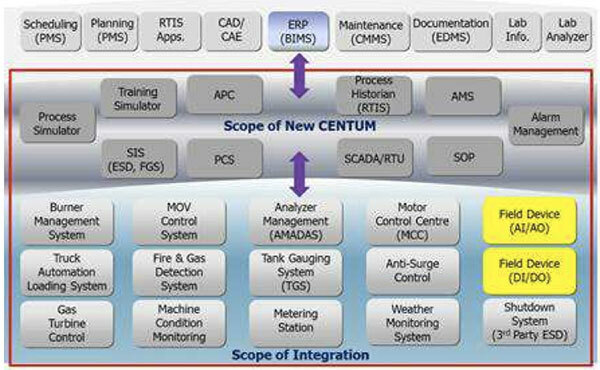 In 2014 Yokogawa is adding significant new capabilities to CENTUM VP. Now the New CENTUM VP becomes the platform for delivering four new innovations; Hyper-intuitive Operation, Total Automation Management, Intelligent Plant Conductor, and Sustainable Plant Operation. Each innovation addresses pain points felt by today's plant owner-operators as they strive for greater operational integrity. Yokogawa has emphasized its objective to especially leverage two enabling technologies in this development program; field digital technology and dynamic process simulation. Field Wireless Capability for Process Control. These innovations are designed to address the business challenges faced by their process manufacturing customers (see figure inside cover). The expectations of plant owner-operators for their process automation systems continue to press against the available technology. Business pressures are what really drive the need for higher utilization and performance from production plant assets. These business demands impact operations and the process automation systems used to manage these operations. The general direction of these business pressures is a drive for greater manufacturing flexibility. The design of existing plants assumed the use of particular feedstocks, operating modes, and product mixes. But today these factors change frequently. For example many refiners now will make spot purchases of crude oil feedstock to take advantage of buying opportunities or to meet demand. They may also purchase feedstock from unconventional (shale) oil and gas operations. This causes much greater feedstock variability at the refinery or plant. Operating practices and the process automation systems need to compensate for these new conditions, either by blending feedstocks to reduce the variability, or by changing the production plan to compensate, or both. Customers also apply business pressures. On the demand side, plants face continuing pressure to shorten delivery lead times and to deliver in smaller quantities. They also will need ability to produce a wider variety of products and grades. Globally, large new production capacity for oil and gas as well as bulk chemicals is coming online. Existing plants may be closer to markets, but will usually have higher production costs. These plants will need to be more responsive to their customers in order to maintain a competitive advantage. Automation projects do not have time for lengthy system integration activities, which can consume weeks or even months of a project schedule. The internal needs of plant owner-operators are also placing greater demands on automation systems. Capital projects of all types need shorter and more reliable schedules, so that new production capacity comes on line quickly and reliability. Projects do not have time for lengthy automation system integration activities, which can consume weeks or even months of schedule. Instead, owner-operators want automation systems that can be fully tested but can still be delivered faster and installed to match their construction schedules. 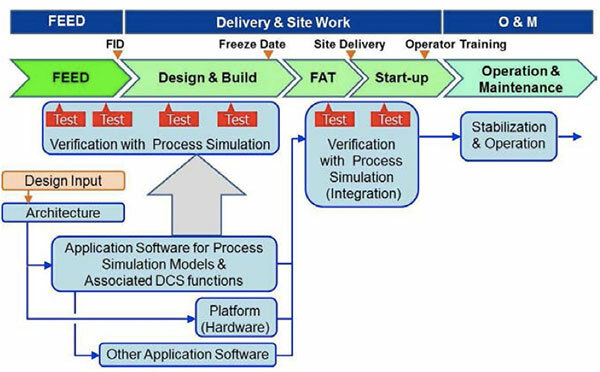 This requires automation systems that are flexible enough to be fully designed, tested, and integrated using simulation and software tools rather than requiring the actual target hardware for these activities. This requires integration of project design tools with the software, so that design changes can be accommodated quickly. It also requires quality process simulation tools during the design phase, so that engineers can work productively without needing system components that have been delivered to the plant site. Owner-operators also realize they need to bring higher quality to their operations and operational decisions. The high profile industrial accidents of recent years have confirmed this view. As a response, process manufacturers look toward more integrated operations, with a focus on the automation platform providing appropriate operational and decision support to workers in many different roles within an organization; control room operators, technicians, field operators, process engineers, production planners, etc. Each has a role in greater operational integrity. The job of the automation system is to provide the required support to each role. The control room operator needs to have a better overall view of the plant process conditions. The automation platform needs to assist operators by showing them more clearly their possible actions, and anticipating the effects of manual operations, so that operators can "see forward" in time. This will improve the responses made by operators in all plant conditions. Automation systems also must reduce operator-caused process variance by reducing manual operations. Systems need to distinguish between conditions that require immediate operator intervention and those conditions that need attention from support personnel only. And the systems need to provide tools to support workers who work remotely from the production plant and the control room. Finally, during the long operating and maintenance lifecycle phase, the system must manage plant changes and use information as a resource to assure regulatory compliance, reduce disruptions from unplanned and planned shutdowns, maintain systems and documents up to date, maintain a system with long-term sustainability, and reduce to a minimum any disruption caused by hardware or software upgrade processes. Yokogawa is a leading global supplier of industrial automation and control systems as well as test and measurement equipment. Founded in 1915, Yokogawa (TYO:6841) is a component of the Nikkei 225 Index with revenues of ¥349.7 billion ($3.3 billion) and market capitalization of ¥416 billion ($3.98 billion). Control and measurement businesses constitute the vast ma- jority of the firm's top line revenue. Yokogawa now has operations in over 30 countries. Yokogawa's corporate culture is characterized by a very deep commitment to product quality. Quality serves as the foundation for the high system reliability that characterizes the company's products, and is the key success factor in the process automation market, where utility-like operation for months or years at a time is the expected system performance level. While its components and systems are highly reliable, customer feedback shows that Yokogawa treats any product failure (however small) very seriously and uses this experience as feedback within the company's quality programs. In addition to quality, the company's systems business has emphasized compatibility with past products as well as comprehensive support. Geo- graphically within the global automation market, Yokogawa's business is concentrated in Asia and the Middle East. For several years the company management has pursued ambitious long term growth goals that involve expansion into other geographic regions, including the Americas. 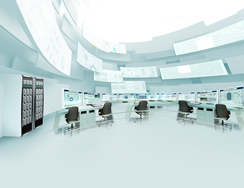 Yokogawa's CENTUM distributed control system has always been the core of the company's systems business. CENTUM VP, the current version, represents the eighth generation in Yokogawa's CENTUM series, which was introduced in 1975. Over its 40 year history, Yokogawa has maintained three key concepts for CENTUM; high availability process control, high system performance, and backward compatibility with previous products. CENTUM VP consists of a high performance Windows-based HMI, high availability process controller, and the highly reliable Vnet/IP real-time control network. To ensure stable plant operations, all CENTUM process controllers employ a dual redundant "pair & spare" architecture. The controllers support multiple field device communications protocols, such as FOUNDATION fieldbus, PROFIBUS, and wireless device networks using the ISA100 standard, all of which can be managed using Yokogawa's PRM plant asset management (PAM) software. Vnet/IP is a fully redundant 1 gigabit Ethernet control network that enables reliability, security and high performance applications requiring real-time exchange of large amounts of data. two specific enabling technologies in this release; digital field devices and dynamic simulation. In discussions with ARC, Yokogawa has emphasized its objective to especially leverage two specific enabling technologies in this development program; digital field devices and dynamic simulation. Of course neither of these technologies is new. But neither technology has been used to its potential in process automation. ARC believes that major plant owner-operators now clearly recognize a need to advance their practices for intelligent field device management. In some cases their recognition has come about because they experience great difficulty in providing effective device support to remote plants, especially offshore plants. These owner-operators perceive value from extending device data and device management into their support organizations, and are interested in solutions that enable this. Yokogawa also believes that the field device evolution toward digital technologies is a priority. It is a key enabler for people (and systems) to understand the state of the devices at a granular level, and for devices to become more autonomous and contribute to condition-based maintenance (CBM). Furthermore future field installations will include both wired and wireless devices, adding a new dimension of complexity and greater scale to the device management task. 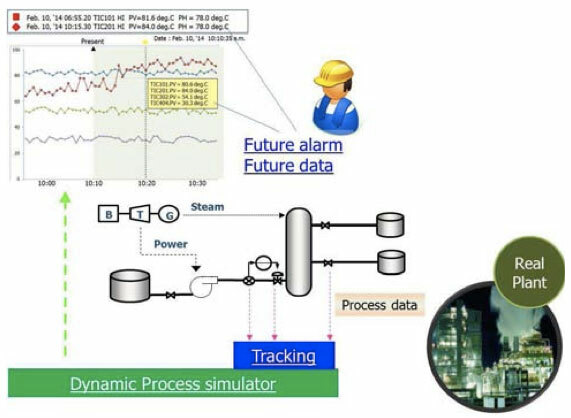 Dynamic simulation is Yokogawa's second key enabling technology. Dynamic simulation is not at all a new technology. What is new is the comprehensive use of simulation models throughout the lifecycle of a system. The barrier to this practice has been the difficulty of model management and model tuning (or "parameterization"). Manual adjustments to model parameters require expertise, are expensive, and can be difficult to maintain. Yokogawa's solution uses its new engineering environment to manage both simulation models and control system and safety system configurations. In addition, digital storage of field device parameters (which is also performed by the engineering environment) reduces the need for manual estimation of parameters and increases model fidelity. Plant operations provides a data-rich environment where properly managed data can be used to improve simulation models, as well as to identify unexpected plant behaviors and performance levels. In developing this New CENTUM VP automation platform, Yokogawa identified four key innovations it wanted the new platform to deliver. These innovations are designed to address new business challenges faced by their customers. Yokogawa also identified two key technologies which it would use in developing these new innovations (see figure below). It is important to understand what each of these four innovations delivers and why these innovations were chosen as the focus of Yokogawa's development efforts. The first innovation is called "Hyper-intuitive Operation". This innovation supports control room operators, with the objective of enabling safer and more productive operation than is presently possible. Human reasoning can be highly insightful and important in understanding the process, but experienced control room operators are seldom able to take time simply to reflect on a high-level view of their plant's current state. Instead they are usually dealing with large numbers of smaller concerns, such as alarm floods, control loops that are becoming unstable, or external disturbances to the process. Their human-machine interface (HMI) often does not assist them to obtain a sound view of the overall situation in the plant. Yokogawa's new Hyper-intuitive Operation provides three capabilities designed to improve this situation. First, a set of top-level displays provides overall situational awareness to the operators. Designed to provide context, not just data, these displays are based on analysis of many low-level process variables, helping operators to quickly grasp the overall state of the plant and each unit. Operators can use these displays to provide overall "meaning" to the sea of process information that lies underneath. Second, proactive operation is supported by a series of displays that enable operators to visualize future trends based on the current state of the plant. Underlying these predictions are mathematical tools such as statistical analysis and dynamic process simulation models. When the operator is always able to "see" these future predictions of where the process is headed, he can be proactive in responding. This will reduce waste, improve utilization and productivity, and help the plant avoid abnormal situations or abnormal operating points. Third, the platform supports scenario-based operation. To do this, all operator actions are captured digitally and integrated with information from the control systems and process models. This capability effectively captures current operating practices. Best practices can then be identified and shared as scenarios. These scenarios then gener- ate operator guidance, improving the consistency of operations in the plant and enabling safer and more productive operation. Total Automation Management is the second innovation targeted by Yokogawa's New CENTUM VP platform. Engineering and configuration software for process automation systems has become a significant pain point for owner operators. They face many hurdles in achieving ARC Advisory Group's vision of the information-driven enterprise. Accurately managing all types of plant configuration in- formation over the entire plant lifecycle is a critical challenge for plant owner-operators. The plant lifecycle includes design, construction, operation and maintenance phases. The number of engineering and software configuration tools has grown beyond the capability of owner-operators to manage. Software tools for managing distributed control system (DCS) configuration/engineering are critical, but are only one part of the engineering toolsets employed by EPC firms and plant owner-operators. Automation engineering software usually represents only a small fraction of an owner-operator's total investment in design and configuration management software. This makes it critical for the tools to easily integrate with other applications. Owner-operators today find standalone engineering tools of limited value, regardless of their quality. Process plants are now composed of many intelligent components and systems. Indeed, even field devices now contain substantial intelligence and operate as subsystems. So do safety instrumented sys- tems (SIS), HMIs, SCADA systems, historians, alarm managers, APC schemes, etc. Each of these systems has become more capable and more complex over time. So has the number and complexity of engineering and configuration software tools they employ. These have expanded beyond the capability of owner-operators to manage them, especially since in most plants these systems employ a number of stand-along configuration software tools. While the software complexity has grown, owner-operators need tighter integration among all these tools. For example in a capital project the field device configuration parameters need to be shared and synchronized with many other engineering applications (DCS, SIS, Alarm management, etc.). Furthermore, owner operators must maintain this configuration data as a resource throughout the life of the plant if they wish to leverage it to improve their operations and (especially) maintenance practices. As the demand for integration grows, a fragmented set of software tools becomes increasingly unacceptable. In response, Yokogawa has taken a "total engineering" approach to their configuration software, integrating tools for a number of automation systems and reducing the number of software tools required. Across all of these functional areas the new platform will feature two important capabilities; a "block building" approach and support for virtualization. A "block building" design approach promotes standardized configurations and captures best practices. This also enables configurations to be adapted for requirements specific to one vertical industry. The automation engineering process occurs using a step by step phased approach; initial design, detail design, implementation, test, etc. As most automation activities and systems engineering activities are executed separately, the mechanism to keep consistency in a project and for management of change (MOC) from the beginning of the project until the end is a key point. A comprehensive master database system can achieve not only the above requirements, but can be used for proactive plant maintenance by detecting plant abnormality even after plant start-up. Thus, it is beneficial in the whole plant lifecycle from design to production operations. This ca- pability is also a part of CENTUM total automation management. Delays in starting production operations lead to large financial losses for owner-operators. The automation project schedule needs to be secure. During the project execution, the I/O design and changes tend to be on the critical path. Quite often the location or design of field I/O interface are not yet determined or they are changed by a later stage of the project. Control application software is linked to the data from such field devices. To reflect the I/O design, application re-validation after modification or hardware marshaling change is needed, both of which require extra time, cost and imply risk. Hardware marshaling is the common technique which has been used, but requires extra foot-print and field cabling work. Thus, the I/O hardware design of the automation system represents a major risk to a secure project schedule. Virtual commissioning capability addresses the need for configurations to be developed and tested with greater hardware independence. Configurations can be developed and tested using virtual machines, while the target system hardware is being installed at the job site. This can significantly compress project schedules by shortening the critical path, saving huge amounts of capital. 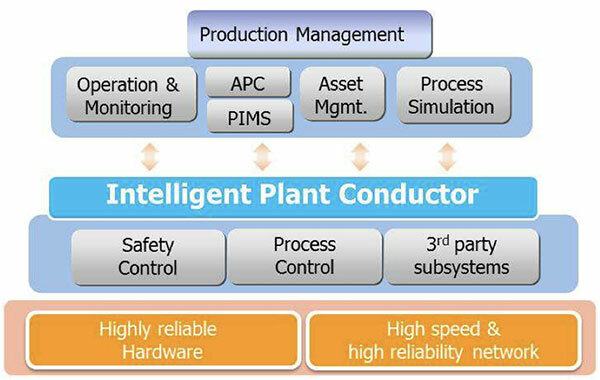 Yokogawa's third innovation is called "Intelligent Plant Conductor". Most process automation systems manage continuous processes. But what does one really mean by "continuous"? Such a plant will start up and shut down. It will produce different grades and mixes of product. It will use different feedstocks. Advanced applications such as model predictive con- trollers and optimizers will be deployed and adjusted. So while the production process is continuous in one sense, many aspects of production and especially production management will be different from time to time. In the real world, process engineers use a series of custom applications (usually developed in a scripting language) to manage the discontinuous aspects of their automation systems (e.g. startup, shutdown, grade change, etc.). 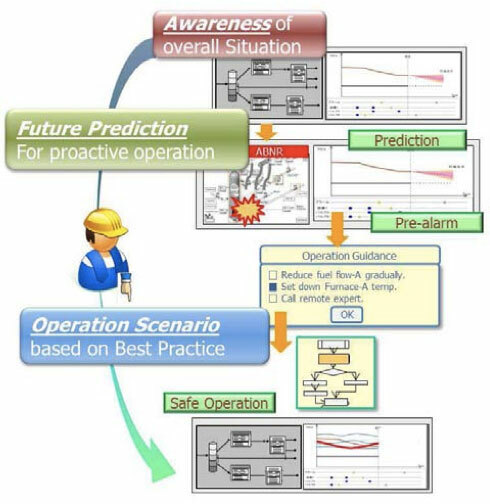 Yokogawa provides the plant supervisory control feature which acts as an executive providing high level supervisory control of all applications operating within the process automation system. Owner-operators can use it as a single secure production application to manage all of their automation applications. This ensures that a consistent philosophy of operation is applied at all times, enhancing the reliability and safety of the automation. This eases the deployment of APC (Advanced Process Control) to process units because the plant supervisory function control compensates for dif- ferences in controllers and subsystems, resulting in shorter time and lower costs in applying APC. Real-world plants operate with multiple automation systems of different ages, making their upgrade choices and processes more difficult and complex. Yokogawa calls the fourth innovation "Sustainable Plant". This provides a solution to the problem of aging automation systems. Generally plant automation systems have a life of 15-20 years, which is roughly half the life of most process plants. So the automation system is often replaced (with significant cost and disruption) midway through the life of a plant. But real-world plants seldom operate in such a simple situation. They use a series of systems, some of which are old and badly in need of upgrade, and others which are newer and do not need replacement. So the replacement issues faced by real plants are more difficult and complex. Sustainable Plant is Yokogawa's solution to sustain and to enhance automation system (and, thus, plant) performance over time and at reasonable cost by fully utilizing the features of field digital and the instrumentation master database from the CENTUM Total Automation Management. The areas which are causing performance loss and the areas which can increase performance are identified, and then maintenance is performed on these portions without affecting complete system operation. The solution extends from instrumentation to automation systems to databases. All of these, whether simple or highly complex are critical components of any plant that achieves sustainable high performance. Yokogawa, through the Sustainable Plant solution, hopes to bring high availability, reliability, and long life to its customers by helping them to manage these critical assets – assets which increasingly consist of information. Owner-operators find many advantages from smart configurable I/O, and these center on shortened schedules, reduced space requirements, and greater standardization. The development of smart configurable I/O for process automation and safety systems is one of the most important innovations in process automation today. The big advantages for owner-operators are shorter project schedules, smaller I/O space requirements, reduced wire marshaling and terminations, greater system hardware independence, and a much more standardized treatment for I/O capacity. Fundamentally, this type of I/O gives customers much more flexibility in their capital projects. End user DCS customers have identified the benefits from that flexibility as most important. Yokogawa's new I/O combines the attributes of a universal I/O module with optional single point signal conditioners. This enables the solution to employ far fewer parts but also cover the full range of I/O signals found in today's plants, including HART devices. To maintain compatibility, the new subsystem uses the same DCS interface as the existing Yokogawa CENTUM RIO. Less disruptive design changes – rewiring in the field is not necessary if signal types change late in a project as detailed design progresses. Changes can be handled point-by-point rather than module-by-module. Later integration of hardware and software – Simulation capabilities of new I/O products enable integration with the "target" I/O equipment to be done at the project site, enabling the I/O equipment to be installed earlier and shortening the overall capital project schedule. Standardized treatment of I/O cabinets and quantities – projects develop standard designs for I/O cabinets that are optimized for I/O location. Additional I/O capacity is added in bulk simply by adding additional standardized cabinets. This is another aspect of handling late design changes without disruption. Greater separation of hardware and software engineering – Customers use greater hardware independence and simulation capability to focus more effort on control software design and standardization. The ability to treat I/O hardware as an abstraction (rather than specific equipment) improves the control software design process and results in higher qual- ity control applications. Smart configurable I/O types have been in the market for some time, and the CENTUM system has had some smart I/O products since 1993, which can be used in CENTUM VP system also. But the new N-IO offers remarkable new benefits. The I/O baseplate serves as a universal I/O module, in that it can accept the most common signal types directly. This includes support for the HART protocol, which is a widely deployed protocol for intelligent field devices. Less common signal types (thermocouple, RTD, pulse, etc.) connect to the baseplate through optional hardware that conditions a single I/O point for the baseplate, so this N-IO is not only applicable for greenfield, but also for brownfield projects. 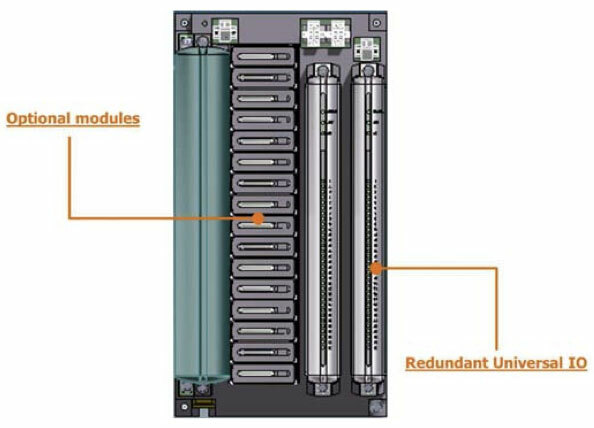 The I/O backplane allows the redundant system I/O interface for high process loop availability. High I/O network speed accommodates the huge amount of field data available via field digital devices. Full replacement compatibility with the RIO I/O subsystem enables re-use of the field wiring. N-IO has significantly smaller footprint, and can be mounted in the control rooms as conventional type installation, and also can be located directly in the field. The modules themselves serve the wire marshaling function, eliminating the need for external marshaling hardware and further reducing field equipment footprint. This brings state-of-the-art I/O functionality to the CENTUM automation system. 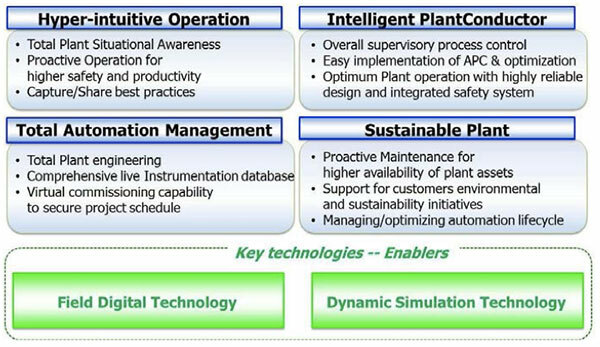 Dynamic simulation is also beneficial in the operating phase of the plant lifecycle. 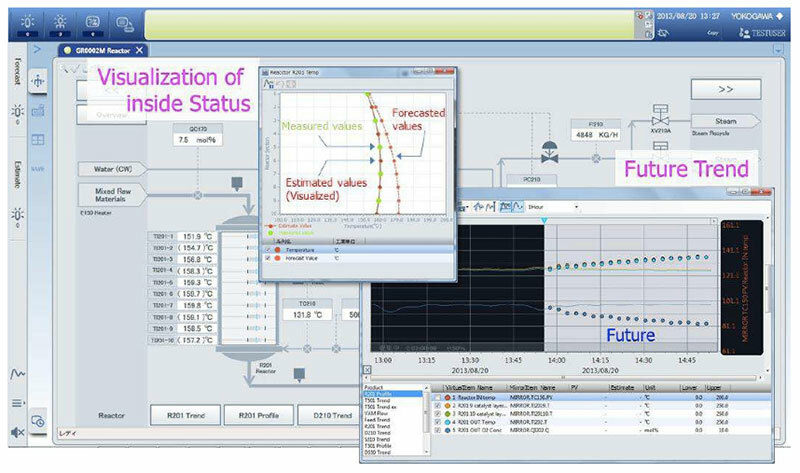 It provides visualization within the control system of predictions from simulation models on the HMI, and can include predictions of unmeasured process parameters, as well as predictions of future process behavior, including alarms. A new key product for delivering this benefit is MIRROR PLANT, Yokogawa's new dynamic process simulator for such applications. Though not a part of the CENTUM control system, MIRROR PLANT has numerous benefits for customers, and one of its key features is to achieve proactive operation on the CENTUM HMI. To operate the plant safely and efficiently, future plant behavior is important information. By knowing the future process behavior, operators can take adequate corrective actions quickly and in advance, avoiding more serious situations. To achieve this proactive type operation, letting operators know future plant behavior accurately is the key. The operating process behavior is not the same as when the plant was designed, and greatly depends on daily circumstances. MIRROR PLANT is a dynamic process simulator for such operational support. The simulator tracks actual process data, and dynamically modifies its simulation models. 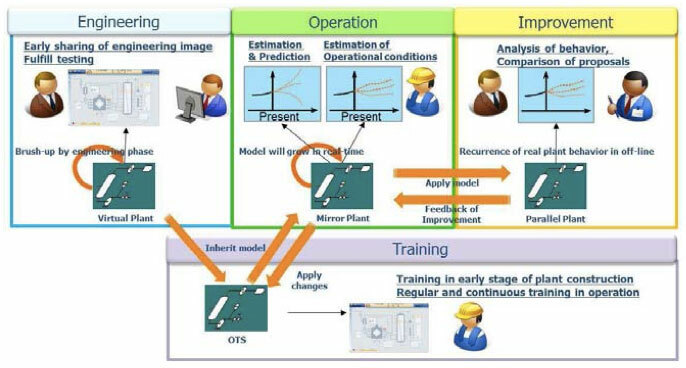 Using this mechanism, MIRROR PLANT can provide future process prediction (process data, alarms, etc.) and indicate process values which are not directly measured by field sensors. Thus operators can know if the process is optimized regardless of current operation. They may be able to find the causes of periodic productivity decreases, or future process conditions which will lead to potential problems later in time. This is critical to achieve safe and productive plant operation. The CENTUM engineering environment has become an integrated project management environment. Its scope is far more comprehensive, including control, safety, alarming, and simulation. Its features include management of change as well as self-generated functional system descriptions. It enables domain specialists in automation, safety, and simulation to easily work within their own domain without the need to fully understand other domains. It also employs an integrated data management system that is itself a life-long resource for analytics and service of the plant during its operating life. Management of Change (MOC) – The integrated engineering environment includes change management system capabilities within the engineering work functions. Change management is critical throughout the life of an automation system. The change management process identifies all the portions of the systems that will be affected by a given change. This results in more complete and accurate modifications and provides a record of the re- lationship between change requests and their implementation. Note that change management functionality extends to simulation models as well as control and HMI configurations. Linkage of design and implementation – The CENTUM engineering work process results in the automatic generation and update of a functional design specification (FDS) document. This document is maintained automatically and reflects the current state of the system configuration, including changes that have been requested but not yet implemented. Application design patterns – The integrated engineering environment uses design patterns as fundamental components. Using patterns shortens engineering hours, but more importantly it increases consistency and quali- ty of engineering. Such consistency pays benefits for operators and engineers alike throughout plant life. Specialization – In most engineering environments, work items are distributed functionally. This requires individual engineers or small teams to have multiple areas of expertise (e.g. control, safety, HMI). The new engi- neering environment can break up and aggregate project work much more flexibly. Teams can thus perform work distribution by discipline or specialty, enabling engineers to specialize and use their strongest skills. The new engineering environment is supported by a consolidated instrumentation database management system. This system serves as a managed repository for the entire life of the project from Front End Engineering Design (FEED) through operations and maintenance. The system is comprehensive, including digital field device information, historian data, and other types of information. Changes to the contents occur through managed operations via the engineering environment. The system also serves as a valuable resource for analytics during the operating life of the plant. As mentioned in previous chapter, field digital technology is one of the key points to optimize plant operation. Field wireless technology can ease applying field digital devices to the plants with flexibility, safely, and lower installed cost. ISA100 wireless technology can be used for highly reliable process control loops with field wireless. To enhance the reliability and to ease applying ISA100 to control loops, the New CENTUM VP supports a specialized PID function block that compensates for any impact of packet loss, and makes the dynamic response after signal recovery smooth and stable. This widens the range of potential applications for field wireless in the plant, contributes to the increase of proactive maintenance capability, and to the accuracy of APC to increase productivity. Smart configurable I/O Yokogawa's addition of smart configurable I/O to CENTUM adds important value to its offering. Though not the first automation supplier to market this type of product, Yokogawa's new I/O reflects an understanding of how customers derive value from smart I/O. Combined with the system's enhanced simulation capability, it appears to provide these values, especially for greenfield projects. It has the additional value for existing installations of the older RIO to serve as a backward compatible high performance replacement I/O. In addition, Yokogawa has preserved its RIO I/O interfaces to serve this new product, enhancing CENTUM system-level compatibility. The challenge here is to make certain that customers derive the maximum value. Achieving that value involves the complete installed system, not just the automation I/O components. The new configuration shows attention to architecture with a view not just of replacing several existing software tools, but of having the DCS serve as a resource for maintaining information throughout its life. Both owner- operator and EPC customers will need to learn how to use this new capabil- ity effectively so that it improves their existing processes for project design and delivery and provides them with effective support during the long operating life of automation systems. 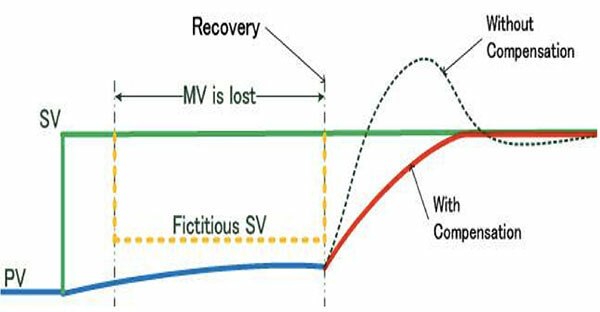 ARC has long promoted the value of simulation and simulation models for the plant lifecycle, but the difficulty of managing these models over time has prevented realization of that value in most cases. In this platform Yokogawa has given an important role to dynamic simulation. To maintain and use such models over time will require excellent tools but also new practices by EPCs and owner-operators. Yokogawa has worked hard to ensure that its CENTUM customers can always upgrade to the latest technologies without obsoleting their current system and applications. In this case both new hardware and new software will bring CENTUM the new functionality discussed here. Achieving value from this new functionality will require the adoption of new practices on the part of EPC and owner-operators alike.